During the housing bubble that peaked around 2006 and then burst in 2008 one of the things that got many homeowners in trouble was using their home’s as ATM’s. They did this by using, in most cases, home-equity loans to take advantage of the equity they had in their homes to give them access to tax-free cash to make improvements on their home, pay for vacations, buy cars, boats, whatever. This was fine until the value of homes began declining which resulted in many of these homeowners becoming “underwater“ meaning they owed more on their homes than they were worth. Hopefully, homeowner’s will remember lessons of the past and be wiser about the use of their equity this time around. 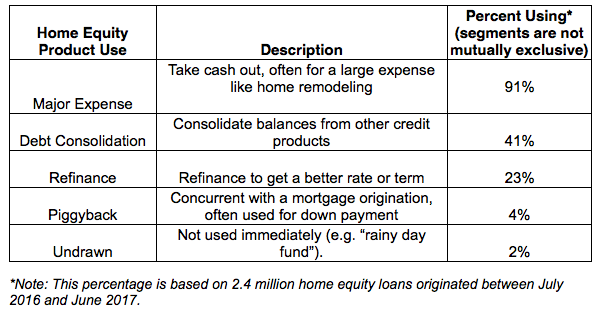 Below is a table from TransUnion showing the top five uses of home equity loans.